Shell to Sea - Free the Rossport Five! Shell to Sea > The West's Awake! What would you do if a court ordered you to accept the installation of a potentially lethal pipeline which no state agency has or will take responsibility for? We are currently in prison for an indefinite time until we accept such a pipeline, which we cannot and will not. Would the people of Mayo or Dublin accept a potentially lethal pipeline through the main street in Castlebar or Stephens Green in Dublin? A pipeline which has a rupture kill zone of several hundred metres. We think not. We have been betrayed by our government, marginalized by sections of the media and ignored by the "alternative" government. Instead it has been the people of Ireland who have sustained us during this time of crisis and personal trauma and who have rallied and continue to rally to our aid - thank you. All we demand is for our families and neighbours to be safe in their own homes - no more no less. A pot full of tea, mugs and a packet of iced teacakes are laid out on the kitchen table in Mary Corduff 's house, ready for whoever comes through the back door. And there has been no shortage of callers to her Rossport home since her husband, Willie, went into Cloverhill prison along with four neighbours for obstructing exploration giant Shell's building of a high-pressure gas pipeline alongside their land. The Corduff house is the nerve centre of the campaign to 'Free the Rossport Five'. The men's wives, Caitlin Ni Sheighin, Aggie Philbin, Mary Corduff and the 'two Maureens' - wives of Vincent and Philip McGrath - are resolute: the pipeline pumping untreated gas will not be going through the bogland next to their homes. Local teacher Maura Harrington is the latest visitor. "Luka Bloom is in Rossport. He's down visiting the camp to show his support for the campaign," she tells the women. Harrington, who is the principal in Inver national school, and Irish Times columnist Fintan O'Toole addressed a packed meeting on the Shell controversy in Dublin last week. "Who is Luka Bloom?" says one of the women to Maura. "He's Christy Moore's brother," comes a chorus. First of all, my sincere sympathies to all the people of the Gulf Coast in the US. These are heartbreaking times there. I had one great night in Tipitina's in New Orleans in a sweltering July in 1988 with The Pogues. God bless you all; you are in my thoughts and prayers. I'm sending out this note to speak briefly about something which has nothing to do with my work. It concerns a matter in Ireland which I find very heavy right now. There are 5 men from a little village in County Mayo called Rossport in prison for nearly 70 days now. They are not criminals. For 5 years they have been trying to protect their village from a project involving The Corrib Gas field; a huge gas resource off the Mayo coast. The project involves Shell Oil, Statoil, and I think Enterprise. The Irish government has granted permission to the oil companies to build a refinery about nine kilometres inland. This means that the untreated gas will come ashore, and a pipe will carry it the nine kilometres; passing on its route, through the village of Rossport, 70 metres from the houses of the men imprisoned. These men, and many other men and women, have been campaigning for 5 years to have the gas refined at sea, and piped safely inland. They have protested Shells' activity and as a result, Shell had an injunction placed upon them. They were brought to court, and told unless they agreed to apologise to Shell and also guarantee they would not interfere with work, they would be in contempt of court and imprisoned. And there they are, in prison for trying to protect their community. They will remain in prison until they 'purge their contempt', or Shell agrees to lift the injunction. Shell won't move. The men will not 'purge' unless Shell lifts the injunction. This is a complicated issue. I am not an engineer, and do not understand the complexities of the project itself. But I have visited Rossport recently, and seen the incredible beauty of the place. I have also seen the madness of this pipe passing so close to peoples' homes. And I have met the families of some of these men. It is easy to see their hurt, that their loved ones are imprisoned for their principles. And it is very impressive to see their determination and strength in incredibly difficult circumstances. I admire them greatly. And I support their call for the release of these men immediately. I believe these people have not been given a proper hearing, to voice their concerns to the Government. I believe their imprisonment to be a gross injustice. I urge Irish people to visit Rossport, and see for themselves the madness being visited on this community. For myself, until Shell lifts it's injunction, and allows these men to be freed and to debate/negotiate with them, I will not be buying any petrol from Shell or Statoil outlets. For further information on this matter, please visit www.shelltosea.com and www.freetherossportfive.com. Website of the 'Free the Rossport Five' campaign. Campaign against Shell's proposed high-pressure gas pipeline in Co Meath. The movement against a US war on Iraq received a local boost this week as activists and concerned residents came together in Kildare town for the 11th annual Féile Bríde AFRI conference. ... The prayers of the people of the town and the conference participants have been embroidered on individual colourful prayer flags, which hang from all the buildings in the town. "The prayer flags are like the ones the Tibetan monks used. They are blowing in the air, they are airborne, the prayers are flying into the cosmos," she said. "It was a wonderful, wonderful conference. It was really the best ever," agreed Sister Mary Minehan. "All the speakers were wonderful." The conference opened on Saturday at St Joseph's Academy at 11.00am. The hall was beautifully decorated with the theme of nature emanating from every corner. The podium was draped with cream material, showered with snowdrops with woven baskets full of rushes surrounding the centre-piece - a large St Brigid's cross. The banner behind the podium was created by students from St Joseph's Academy and was painted bright yellow with the words Féile Bríde painted in purple. The conference began with a number of speakers talking about the history of the town, to a soundtrack of birds singing. Then the beautiful haunting voice of Deirdre Ní Chinnéde echoed through the hall, as she sang about the fruitless nature of war. She was accompanied by Ellen Cranitch on the flute. The flame of Brigid was brought to the centre of the podium, where it shone brightly......... On Sunday, the flame of light was lit by Cathy Kelly and Ciarán O'Reilly after a march from the conference hall to the town square. 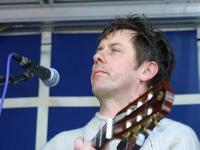 "Luka Bloom was absolutely fantastic. He sang his song, called 'I am not at war with anyone'. It was great, Luka is also involved in the peace march," said Sister Rita. There is an action-packed week ahead with a variety of events planned for the remainder of Féile Bríde. Performance artists include Luka Bloom and Glen Hansard. Luka Bloom's latest single, 'I am not at war with anyone', was written and produced especially for this occasion. It is not for sale and has been released this week for nationwide radio-play. Glen Hansard, lead singer with The Frames, will also perform. ... Over 500 people walk nearly 6 miles from Bunratty castle to Shannon Airport. The crowd was addressed at the airport by former UN assistant Secretary-General Dennis Halliday. A number of musicians including Luka Bloom performed on stage. Celebrating Boglands is a book of many moods, some sombre, some serene, evocative of the landscape, some steeped in recollections of a life with different challenges, pleasures and fears, and some anecdotal. It is a book to be read in little morsels, so as to savour its many moods. It is also a visual journey through sparkling bog pools, colourful carpets of bog moss and 10,000 years of history, seen through the eyes of artists, photographers and sculptors (Editors Note 1). - International group of 36 contributors: Myrtle Allen, David Bellamy, Luka Bloom, and many more. The double-album UnderCurrents is a showcase of artists who performed in Galway last year, including Relish, Mundy, Damien Rice, Juliet Turner, Luka Bloom, David Kitt, The 4 of Us, Jack L, Hothouse Flowers, The Devlins, and Don Baker. Strong performances from major artists such as Ron Sexsmith, Bela Fleck and Bruce Mathiske are also included in this not-to-be-missed album. Jon Richards of Galway Bay FM recorded the artists in the station's studio, and has pledged proceeds from the album to both the GSPCA and Enable Ireland. ... The students will drive two aid ambulances across Europe to bring relief to an area of Belarus still suffering the effects of the Chernobyl Disaster of 1986. The ambulances were purchased with the proceeds of a sponsored walk last November. On Sunday, 1 April, 2001 a convoy of twenty ambulances and six forty foot trucks will leave Ireland for the Chernobyl region of Belarus. As a way of thanking the Irish students for taking part in the 10K walk, numerous bands gave tracks to a compilation CD that was given to all students who took part in the charity event. Bono, Luka Bloom, Ken Doherty and Dave Fanning all endorsed the project which USI hope to repeat on an annual basis with the support of Bank of Ireland. "We also want to thank the various artists who contributed to the special Students 10K Walk CD. Because of the generosity of artists such as Kila, Juliet Turner, Dara and Picturehouse each student taking part in the walk gets this attractive compilation CD FREE as soon as they hand in their sponsorship card. Finally, we also want to thank Manchester United, Bono, Luka Bloom, Dave Fanning and Ken Doherty, who have all endorsed the Students 10K Walk." Glen of the Downs is a semi-natural woodland which is a listed Area of Scientific Interest rated of National Importance (An Foras Forbatha 1981). The protected area covers 95 hectares. It is also a designated National Nature Reserve (designated 13 June 1980) and is thus protected under the Wildlife Act, 1976. Get the inside story from those involved in Ireland's first road protest. Have you ever wondered what it would be like to live in a tree - or a hole in the ground? On Wednesday, there'll be a chance to find out, when RTE screens a documentary to mark the first anniversary of the end of a campaign by a group of environmental protesters at the Glen o' the Downs in Co Wicklow. In 1997, groups of protesters came from all over the country and from abroad to protest against the destruction of the glen's eco-system. They made their homes in the ground and in the trees. Before too long, media images of the protesters confronting chainsaw-wielding officials had captured the public's imagination. The battle moved from the glen to the courts but, following High Court and Supreme Court hearings, injunctions, and imprisonments, Wicklow County Council was given the all-clear for the road works to begin early last year. Mike Casey, a Galway based filmmaker, took his camera into the glen for six months in 1999, as the campaign was reaching its climax. Casey, whose background is in sociology and journalism, had made a film called "Dole Eireann" in 1997, about "Ming the Merciless", the Galway campaigner for cannabis legalisation. "I was looking for people who were prepared to go to jail for their beliefs," Casey said. "The idea of people living in a wood in opposition to a roadway was a romantic notion, and it just looked like a good story. It was a very nice quiet place at that time. The High Court case had just finished and they were waiting for the results," Casey said. "There was just a bunch of people living in relative harmony in a forest. It looked quite ideal." Roisín McAliskey is entering her eighth month of pregnancy in a British prison. She has been harged with nothing. The British state cannot cope with Roisín. The German authorities have colluded in the charade which is an abuse of her rights as a woman and as a mother-to-be. Her case has become an international scandal. Deirdre McAliskey, Roisín's sister returned from New York on Monday 10 March to speak at a benefit gig organised by the Justice Campaign in Dublin. Christy Moore, Eilish Moore, Luka Bloom, and Yenanja performed, adding to a extraordinary line-up which included musicians Noel Hill and Tony McMahon, Cormac Breathnach, Conor Byrne and Kila. The Burren in Co. Clare, Ireland is one hundred square miles of unparalleled beauty. This limestone landscape is acknowledged as an area of international importance for its flora, fauna and turlough/water ecology. The district around Mullaghmore represents a unique association of limestone pavement and turloughs which supports a diversity of rare habitats and flora. In 1988, in recognition of its importance, the state Wildlife Service recommended the designation of the area as a Nature Reserve. In April 1991, the Irish government announced the establishment of a National Park within the southwest region of the Burren and (without consultation) unveiled plans for an associated interpretative centre which it proposed to locate in the heart of this region, close to Mullaghmore Mountain. While the establishment of the park was generally welcomed, the site chosen by the Office of Public Works (OPW) for the centre gave rise to widespread protest, based primarily on concern for the delicate ecosystem of the area. Broadcaster, band manager and music producer P.J. Curtis only discovered Irish traditional music when he moved from his native Co Clare. Now living there again, he tells Eileen Battersby how he became a 'blow-in' in his former home county. The Sound of Stone, a CD featuring Artists for Mullaghmore, was released in 1993. All the proceeds, as well as all monies from fund-raising concerts, have gone into the campaign. Luka Bloom's The Fertile Rock became a kind of anthem. The group took their case to Europe, outlining not just the threat to Mullaghmore, but also to Luggala in Co Wicklow, Dunquin in Co Kerry and the Boyne Valley in Co Meath. "We went twice and presented our case to the commissioner, Bruce Millen. The only two politicians who ever supported us were Mary Banotti and Pat Cox. Their help was crucial in allowing us a voice in Europe." The proposed centres in Co. Kerry and Co. Meath went ahead and have since been opened. Music is the most powerful human sound. We place these 14 icons of music before the mountain. With them we praise the ancient music hidden in its silence. We thank all the artists who for two years have given so freely and faithfully off their gifts. We thank all who have stood with us. May the spirit of Mullaghmore bless everyone. Enjoy the music!